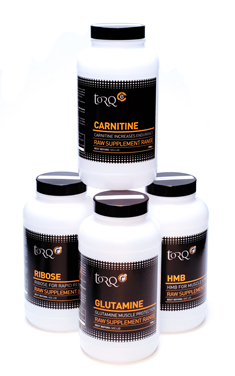 TORQ’s new RAW supplement range offers precisely what’s said on the tub – raw supplements that are 100% PURE. We use the highest quality pharmaceutical-grade, non-animal based material. We do not mix, blend or dilute. All TORQ RAW products are suitable for Vegans. 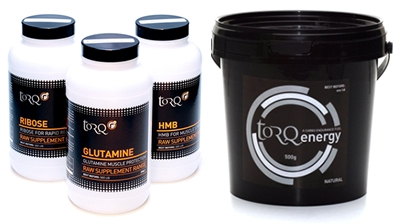 Two of the TORQ RAW supplements you will have heard about before (TORQ ribose and TORQ HMB), so we won’t pull the wool over your eyes – these have just been re-branded. We decided that it was important for us to package some pure, unadulterated and highly potent supplements for athletes who appreciate the higher level of flexibility this offers. It also creates a range of products that the customer can view separately from the rest and make careful choices as to whether they want to include them in their nutritional regimen. [R] symbolises that the product helps with ‘Recovery’. [E] symbolises that the product enhances ‘Energy’. For further information on all of these products, please click HERE. TORQ MCT is a ‘Medium Chain Triglyceride’, hence the term MCT. This is a special fat that is very easily broken down and metabolised. This has obvious implications for endurance performance. TORQ creatine is nothing new eh? Well we’re hoping it is. We’re currently trialing a new form of creatine, which is much more readily absorbed than traditional creatine monohydrate and doesn’t have the weight gain issues associated with it. If trials go to plan, we will launch this in May and it could offer the endurance athlete the explosive benefits of creatine supplementation without the weight penalty. We’ll keep you posted. Click HERE for more details on TORQ Vegan Recovery.